Things haven’t been the same in our house since Charlie Messenger came to live. Of course, being an addition to the family, we set out to make Charlie feel as welcome as we could. But there were just some mental scars from his long incarceration that only time could heal. At first, Charlie seemed to be suffering from some form of agoraphobia, in that the ceilings were too high for his comfort, the walls too distant, the space between too vast. Charlie had no sooner stretched his legs around the house than it dawned on him that these were not the surroundings to which he’d become accustomed, and he went into a timid shell. He folded his arms and his shoulders seemed to shrink in on him, as if he was hugging himself for protection. For days all he wanted to do was lie in bed with the covers pulled over his head. He didn’t eat much, he didn’t say much. Soon enough, however, Charlie found his appetite, his voice (in spades) and began to enjoy his new-found freedom. And then the walls and floors, for all their height and width, could no longer confine him, as his cell once had. Charlie proceeded to introduce himself around the neighbourhood. Joan next door was first to meet him. She seemed quite tolerant, diffident to his impromptu visits. But we naturally fretted about the temptations lying just across the other low wall of our town house. Still, Charlie is smart, and he quickly realised there was nothing to be gained in ruffling neighbourly feathers. Indeed, I have been impressed by not only Charlie’s keen intellect, but his unequivocal expressions of independence. I wasn’t used to being told off, or told so forcefully and so succinctly by somebody exactly what they wanted, how they felt. It took a bit of getting used to. At no time has Charlie left any of us in any doubt about his thoughts and needs, but I suppose that’s a good thing. Charlie has become a night owl, a compulsive stop out. I no longer worry about him so much, now that he seems to have found his way around. But the slightest click at the door will still wake me at five in the morning. Of course, I wonder where he’s been all that time. There’s no point in asking. Unhappily, this sort of thing doesn’t work the other way. There are howls of protest when we go out, and leave Charlie minding the house. I’m still figuring out whether the look he gives us from over the balcony is mournful, scornful, or a mix of both. But, then, having been caged in and shut out from the society, I suppose being left alone holds no appeal for him. What holds little appeal for us is that, after one of his nights on the tiles, Charlie, upon his return home, allows us just one more hour’s shuteye before waking us to tell us about his ramblings. At this time of the morning, his guttural voice can send a chill down the spine: it sounds as if he’s been gargling with absinthe and cigarette ash. 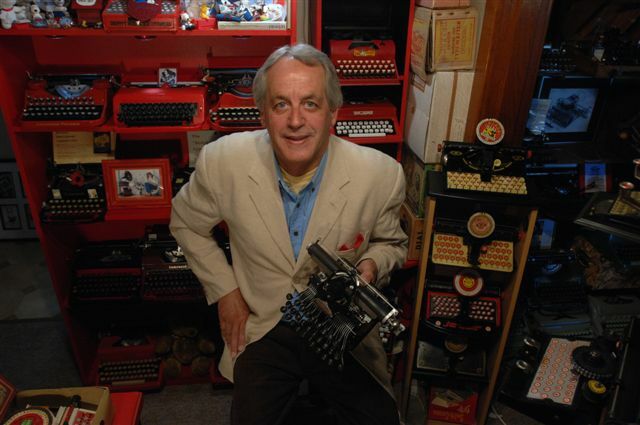 It was to be expected that Charlie would be intrigued by a house full of musty old typewriters. Since they are propped up along the walls and sit on benches and desks, they’re difficult to avoid. Thankfully, to date, he’s only knocked over one, but no damage was done. He’s quickly picked up on the vibe that he can look but not touch. He seems to respect that. Charlie is fascinated by the things we take for granted, like rain. Having been locked away from the world for so long, for him the elements are now something to be soaked up, appreciated for all they’re worth, enjoyed while they last. Tiny chips of timber and pollen, swimming along the deck in riverlets, can hold him mesmerised. The temptation proves too great, and he sometimes forgets rain is wet and cold. The Charlie we have come to know and love is warm and cuddly. Others before us had come to recognise that. Charlie had only been living with us a few weeks when the annual report was published by the organisation which had provided him with food and shelter for a year. Imagine our delight to see a large colour photograph of Charlie on the front cover. It gave us the clear impression that Charlie had been a star inmate, a shining example of the benefits of this organisation’s care and rehabilitation. I should here let the cat out of the bag. Charlie is a cat. His year-long incarceration was with the RSPCA at Weston. He had arrived at the cattery with his mother, as a small kitten. His mother was adopted and when Charlie grew old enough to leave, he fell ill with cat flu. We were just so fortunate with our timing, since he had recovered and was once more ready to be “rescued”. The RSPCA had called Charlie Echo. My sons took a line through Alpha, Bravo, Delta, Foxtrot and settled on Charlie. We all think it’s a more appropriate moniker for our new mate. Our family would like to thank the RSPCA for taking such good care of Charlie, until he found a new home with us. We would also thoroughly recommend that anyone feeling a need for a friend and companion, for great company, they should, like us, adopt a cat from the RSPCA. Charlie, meet Nancy Blackett, a fellow foundling from the back streets of North Acton. Robert, when he's out, he's just sleeping somewhere else. The hour a day cats spend awake is usually just sitting, staring, eating or moving onto the next (warmer) place to sleep. Hi Rob, Nancy is absolutely stunning! nice looking fella. I long ago gave up having outdoor cats. My first one ever to exceed ten years was indoors-only. All ours are from the streets, none of whom have passed through the shelters, which is unusual for us. The most recent one, Bronson, likes to watch the typebars jump. Your story of Charlie was absolutely heartwarming! We rescued our cat Rupert from a shelter in Vancouver BC when I was touring Canada w/Phantom in '06. Rupert had been in a cage for over 6 weeks, until he adopted us. His most recent post features my Underwood No. 5.